I made this map for Epic World – Cinematic Landscapes, a sampling album by composer Eduardo Tarilonte. The map will be used as a background on the album cover. If you take a close look at some of the names, you’ll probably recognize quite a few. I didn’t get lazy with naming things, they’re actually relevant to the product and intentional. The rest of the names were mostly generated with the excellent Everchanging Book of Names. The landmasses were made with CC3, which is my usual software of choice. The rest was done in PhotoShop because I decided I wanted to do some experimenting. I also got the sea monsters from CC3 symbols, but re-drew them with my new tablet in PhotoShop (that was part of the experiment – never used a tablet before). The map was greatly inspired by some of the community members of the Cartographer’s Guild. Unlike most of my maps, which are free to use for commercial or personal use, please only use this one for non-commercial purposes. Thanks for the open use of the maps you create. I’m a content writer with a creative writing column on Examiner.com. I find this map appealing and am sticking it on an article about creating a fantasy world for reference in writing a fantasy novel. Just thought I’d let you know where I was using it and how much of a help this site is. Keep creatin’! I’m glad you found a good use for this map. I’ll be sure to check out your articles. I have to say, your best work is your black & white stuff. Okay, so this isn’t technically just black and white, but I think you get what I’m saying. Thanks Dan, I guess I’m just a monochromatic type of guy. I love this map, what fonts did you use? Thanks Crispy. The fonts are Packard Antique (small font) and EcuyerDAX (big font). Thanks! This helped me out a lot in preperation for my story. It gave me a better understanding on how to put my thoughts on paper. Is there any chance of being able to use the country shapes, no names or anything or is it completely banned for any commercial use to all? Merely wondering because the map is stunning and perfectly suits the game that I am currently designing. Beautiful Work. Since I received compensation for this map and it was used for a commercial product, you wouldn’t be able to use the exact shapes for other commercial use. However, there is nothing preventing you from drawing inspiration from it and using very similar land forms in your own work. Thanks. Shall get to it now. Check out Kickstarter relatively soon for a project named Paradox. Thanks for the use of your map! It will inspire my pupils to write their own myths in my class- thank you. Can you please give me the names of brushes used in this one? Trees and mountains came from Wag – you can find the brush set at Cartographer’s Guild. Thank you soooooooo much for this! 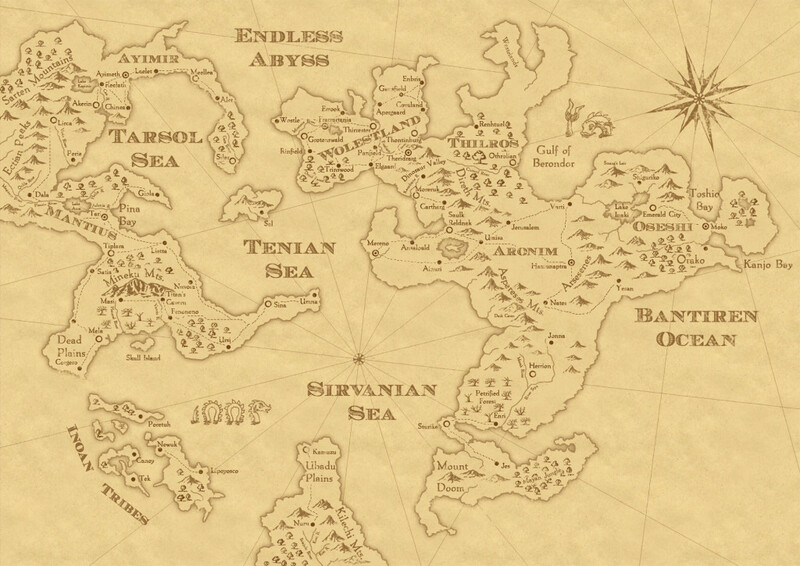 I am currently writing a fantasy series and this map is just what i needed! I will dedicate this series partially to you for this!!!! THANK YOU SO MUCH!! Just wanted to drop a line, and let you know we were using this map as the campaign setting for a IRC roleplaying/storytelling group. The map is great stuff, full of locations that beg for stories to tell about them. Hi there. Ive been looking for a map example like this for a while. This map is the exact style of how I want to do my maps for my writings. I would really love to learn how to do this style of catography? Im currious, is there any particlular way I could ? You’d probably just need to find some basic tutorials on layers and filters with photoshop and you’d be good to go. I am currently trying to start up a small project, however I lack the art skills to draw such an amazing map. I have a couple of sketches what it supposed to look like, would you care to give it a try? A good place to start is the Cartographers’ Guild. Just wanted to let you know, using this map (and actually a few of the sample tracks from the product you made it for (and others by the same artist)) as a huge inspiration (and probably the main campaign map) for a 5e D&D campaign. I did have a question about what you imagine the city of Tar to be like? Hey, I love this map So much! I would love to use it in a DnD campaign. However I would like to change the names, would it be possible to get a copy of this map without the names? I would so appreciate it. I just do not have the photoshop skills to remove the names and rename. As a cartographer, I seriously can’t get over how good your maps are. They are very high-quality maps. Could this map be printed withOUT any names? I like it and would like to use it my campaign, but I wish to change the names.